I popped the question this past weekend and it was a success! She loves the ring and can’t stop looking at it! I want to thank you so much for all your help and making this whole process as smooth as possible. So thank you very very much! 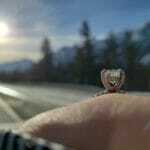 Attached is a picture of her wearing it while we were in the Rockies this past weekend. My wife absolutely LOVES her solitaire ring. She can’t stop staring at it. I am really happy that I worked with you. Thanks for everything. Thank you so much for my incredible engagement ring…it couldn’t be more perfect. I just received the ring and it looks absolutely beautiful. I couldn’t ask for anything different! Thank you for helping my fiance create my dream ring. It really is everything I’ve always wanted and it’s so surreal looking down at my left hand everyday. I’ll be contacting you in the Spring to start designing our wedding bands and we can do my annual cleaning then.